The following four green building tips will make a home dramatically more energy efficient. Someday these simple design suggestions will be part of the design of all buildings, as they add nothing to the construction cost in most cases. Additional roof and wall insulation will make the home even more energy efficient. At the time this house was constructed, code required insulating the roof to R-30. We insulated the roof to R-50 to R-55. It cost just a bit more, yet will reduce energy bills for years to come. Build small and build only what you need. Put your money into visual details instead of square footage. This will dramatically reduce construction costs and the monthly cost of heating and cooling the building. Face the long side of the home to the south (in the northern hemisphere). 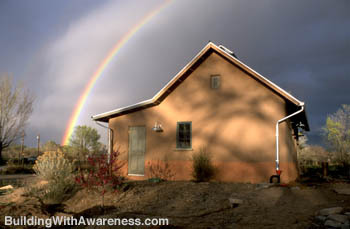 This simple step, which is so simple to do, allows the home to collect and use solar energy. The windows facing the south are then able to permit direct sunlight to enter the home in the winter (if heating is needed). 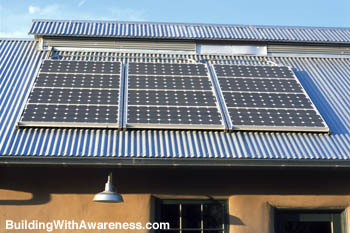 It also allows for the mounting of solar panels on the roof to heat water and generate electricity. Pay attention to window placement. If keeping your home cool in the summer is important, then attention must be paid to the size and number of windows on the east, and especially the west, side of the home. Just because the home is heavily insulated with straw bales, or some other form of insulation, does not mean that is will never overheat. If winter heating is needed, too many windows on the north side will only drain the home of heat. The west side of this home has only one window to prevent overheating in the summer. Trees can also be planted on this side to shade the wall. 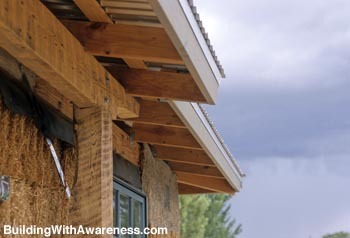 Design the roof overhang to control the sunlight entering the home. The diagrams below, from page 22 of the “Building With Awareness” guidebook, shows why this works. 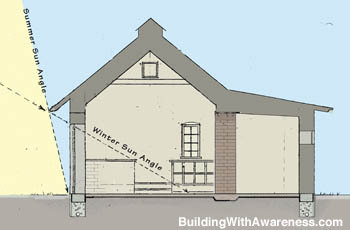 The length of the overhang is easy to compute by looking up the sun angles for summer and winter in your area. The sun is low on the horizon at high noon in winter. The roof overhang and windows allow sunlight to enter the home. When it strikes the darker-colored surfaces of the floor and walls, this light energy is converted into heat energy. The thermal mass absorbs this heat and slowly releases it back into the rooms at night. The summer sun is high above the horizon at noon. The roof overhang now prevents direct sunlight from entering the home. This keeps the interior much cooler. You can actually design the overhang to cut out direct sunlight in the month that you choose. If your spring season is still cold, more sunlight can be allowed to enter.